Cazenovia, N.Y. – (May 8, 2014) Tadashi Hashimoto's work, Grounding Sky, will be on display in Sculpture Court at Reisman Hall from April 2014 through April 2016. Hashimoto sculpts with geometric forms to bring about the articulation of gravity, motion, space and light. The physical order of Grounding Sky is resultant from maximizing the sculptural form to receive interference light waves in reaction to color. Hashimoto paints various sides of the geometrically ordered rectangles in tones of blue, reminiscent of the sky. The sculpture’s angles and spaces capture a variety of light and shadow situations, enclosed and exposed. Hashimoto augments spatial and surface relationships, creating interactive tonalities of blue reflecting throughout and beyond the sculpture. In this new sculpture, color is objectified in the real space, absent of the illusionism found in the surface of a painting. Hashimoto sees this outdoor sculpture as a conductor for sunlight with the blues of many surfaces creating a connection to the sky and to the implication of the Earth and existence. In his artist statement, he states, “My direction in sculpture is to visualize and create a space that is evocative of a cosmic perspective, one nevertheless gained by meditating on the world around me. These sculptures … employ the familiar qualities of wood, stone or steel, yet the sculptural dynamics suggest mysterious unseen forces at play. Hashimoto added, “Observing and wondering about forces in nature fortifies my sculpture. In my recent works, multiple cube-like forms or curvilinear rhomboids appear to be in free-fall, either upward, downward or possibly frozen at the topmost point of motion. 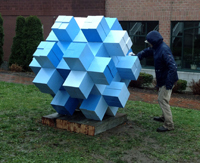 I have devised methods for stabilizing the blocks in the sculptures, even as they give the appearance of instability. Time and change are also hinted at in the details of the materials such as the grain of wood, light and shadow, color relations and surface textures. Grounding Sky has been created in honor and memory of Joan Nelsen (Staten Island, NY) artist, textile designer, art patron and friend of Tadashi Hashimoto. To read more about Hashimoto, visit http://www.cazenovia.edu/news-and-events/event/grounding-sky. For information contact Jen Pepper, gallery director, by e-mail to jpepper@cazenovia.edu. 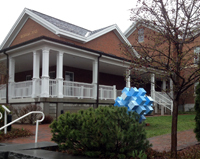 Information is also on the Web at http://www.cazenovia.edu/art-gallery. Cazenovia College, founded in 1824, is an independent, co-educational, baccalaureate college located near Syracuse, N.Y., offering baccalaureate programs in the liberal arts and professional studies. Embracing student success as its primary mission, the College comprises a diverse yet close-knit residential community that fosters intellectual, social, and ethical growth. Our experiential and co-curricular learning opportunities and dedicated team of faculty and staff provide for an individualized educational experience that balances academic and student life. Cazenovia, named one of "America’s Best Colleges" by U.S. News & World Report, is also a national College of Distinction. For more information, visit http://www.cazenovia.edu.